Our 70s house has a hallway that is a continuation of the structure of the garage (not a clue what to call it other than that). As a result, it has no light coming in other than the front door (a 70s style all-glass with a white band in the middle. We intend to extend the hallway by getting rid of the porch area and fitting a new modern door. Unfortunately this will reduce natural light even further, so I have come up with the idea of fitting the cloakroom with a white door that has a opaque glass porthole. Trouble is, I cannot find one that is reasonable in terms of cost (£500 plus). Has anybody done something similar? I don't want anything antique as we are going for a modernist look. What do your other internal doors look like? If you buy any solid wood door you can cut an aperture in it and put a piece of glass in it, i've done it on more than one occasion. It just has to be Solid Wood. Another alternative is a glass transom window above the door. Quite common for bathrooms as it gives light but maintains privacy. It would be something your builders would make to match the width of the door rather than off the shelf, but not too pricey I'd have though. Hi Mark, Screwfix have a range of portholes that can be fitted to doors https://www.screwfix.com/p/mottez-round-porthole-vision-panel-390mm-brushed-polished-steel/9403r I cant vouch for the quality but maybe that or something similar could work for you. Should be easier to find a suitable plain door and use some opaque film on the glass than find the whole door. 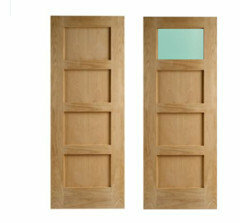 The rest of the doors will also be replaced with the same style (just not with a port hole!). Or you could find another partially glazed door you like the style of and then add the opaque films to give some privacy so it’s not clear glass? Front door & porch help needed!! Downstairs cloakroom - which wall or walls should I paper?